Following last week’s massive news that Big Four firm, EY, had acquired the 1,000-strong Legal Managed Services (LMS) arm of Thomson Reuters, there remains one big question: what is EY’s strategy? 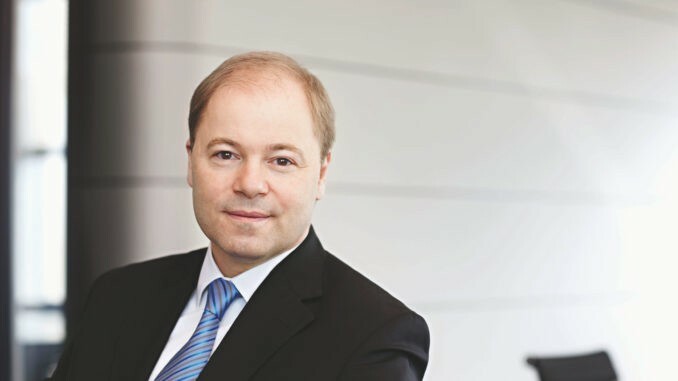 Artificial Lawyer spoke with EY’s Global Law Leader, Cornelius Grossmann, to find out. First things first, why? Why acquire 1,000 people in an LPO to add to EY’s already large number of lawyers and recently acquired group from Riverview? ‘[With this acquisition] we have jumped ahead two years. And it’s a top brand in the LMS field,’ he adds, in explaining the strategy. And that last bit is important: strategy. EY didn’t just make an impulse purchase as it fancied having some extra LMS staff. It did this as a carefully thought out plan with the intention of getting somewhere. The key words other than ‘strategy’ here are therefore ‘jumped ahead two years’. I.e. EY feels that it is now two years closer to achieving its strategic goal than it was a week ago. And that is a big step for a business that already has 2,400 legal professionals across 84 countries. In effect, EY, which had revenues of $34.8 billion in 2018 and 270,000 employees…..yes, you read that number correctly, 270,000 employees…..also has a global law firm with now a globally sized LMS team mixed in there and that its client base can leverage. 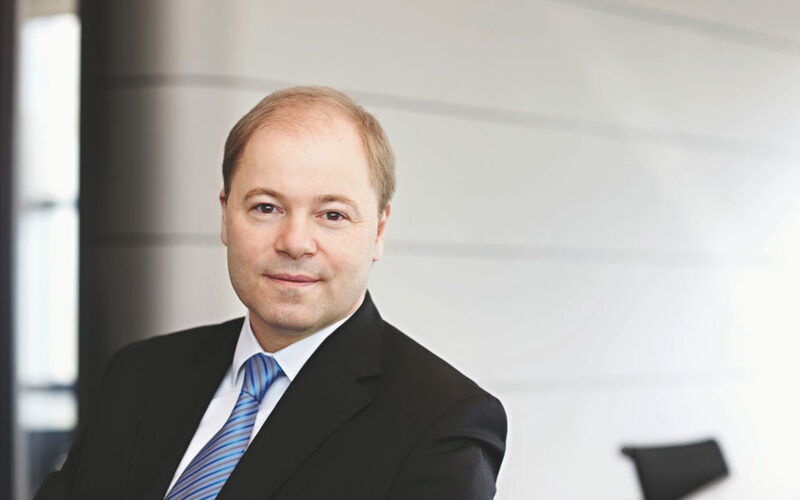 One thing Grossmann highlights is that bringing in more legal businesses into EY is currently an active focus of the Big Four firm. In short, expect more news in the months ahead about law firms joining EY. And, it should be noted, ‘EY Law’ is already very busy offering a range of services to its clients (see graphic below). 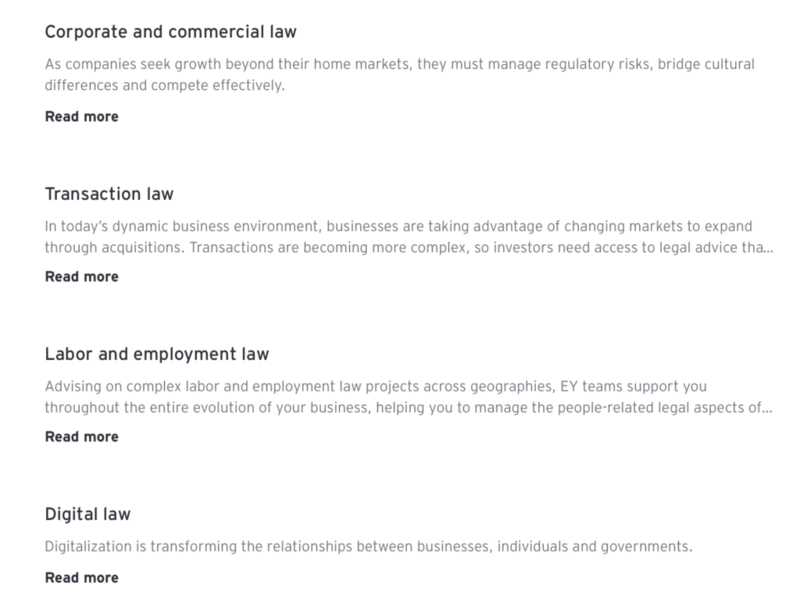 Four key areas where EY Law is already offering extensive services. Of course, where those new firms are will have varying impacts. If EY adds a small firm in Central Asia that would be great, but doing a deal with a Top 50 UK law firm – now that would be something spectacular. But, as said, Grossmann is not going to open up about specifics or give hints about where next. We will have to wait. It must be tempting though for some law firm partnerships in major commercial centres to consider what a future would be like inside such a hugely resourced organisation. Imagine never having to spend time arguing about ‘what colour the carpets should be’, or if the firm can afford to bring in a new piece of software? Certainly in markets such as the UK where the regulatory regime is highly supportive of lawyer and non-lawyer-owned businesses, then anything is technically possible. But, what about the US? Artificial Lawyer picks up the point that many people in the US seem to be unduly worried about the Big Four, even though they cannot practise the law of New York, California or any other US jurisdiction, because of Sarbanes-Oxley and local Bar rules. He adds that they also have some foreign lawyers based in the US, but again, they don’t compete with local firms. In fact, Grossmann adds, they work closely with a number of American law firms. ‘We co-operate with US law firms so there is no need for something there,’ he says. 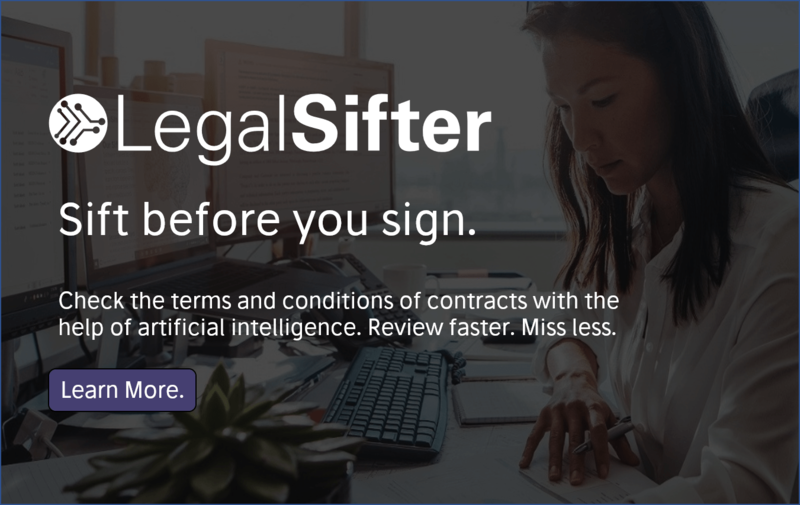 Artificial Lawyer asks if he thinks anything will ever change in the US? After all there have been discussions about liberalising the rules on law firm ownership for 20 years and there has been very little progress. We also touch on efforts in California to possibly open things up there, where the debate is perhaps most optimistic. To give you the short version, Grossmann does not seem to expect anything significant to change in the US regulatory position any time soon. So, American lawyers can sleep easy in their beds. Arguably, EY could become a useful resource for US lawyers to refer work to globally – at least those that don’t want to build their own LPO or global network of offices. Grossmann says of the LMS group, ‘everyone there is coming [to EY] and they are very excited. There are more than 1,000 employees who have signed, which is a very good sign’. The management of the LMS area and the one who will work on integrating it with EY, as well as Riverview, will be Jeff Banta, the Global Law Co-Leader. He was previously Deputy Vice Chair, Americas Tax in Chicago, and before that COO at EY in Brazil. ‘He has been leading on the transaction (of the LMS) and he will be legal ops leader for EY. He will look after this, and the integration of the businesses to create one brand, one technology platform, one model,’ Grossmann explains. And the AI part? This matters, at least for the AI companies, given the potential volume of work that could come from this. Will it be eBrevia or Luminance, or another company now? ‘We will have no exclusivity with any AI providers. We will compare solutions and decide what is best for each matter. Equally, we are not changing horses,’ he adds. I.e. keep using what they have, but use what works best in each case. Is This All About Process? To wrap up, Artificial Lawyer asks about the wider strategy here. Is this primarily about having a great process capability? And, no doubt there are many ‘traditional law firms’ out there who were hoping that the LMS deal meant EY and other Big Four firms are only going after the operations work. But….they are not. This is ‘operations and domain’ – which is a neat way to explain the bifurcation of the legal sector’s work product. Grossmann is understandably in high spirits, and he should be, he has the fantastic job of helping to build out EY Law around the planet. Moreover, as noted above, they have just managed to leap forward two years in their strategic plan. The group now has even more momentum than it had before and no doubt that may well help to encourage other legal businesses to join forces with EY. In short: exciting times. 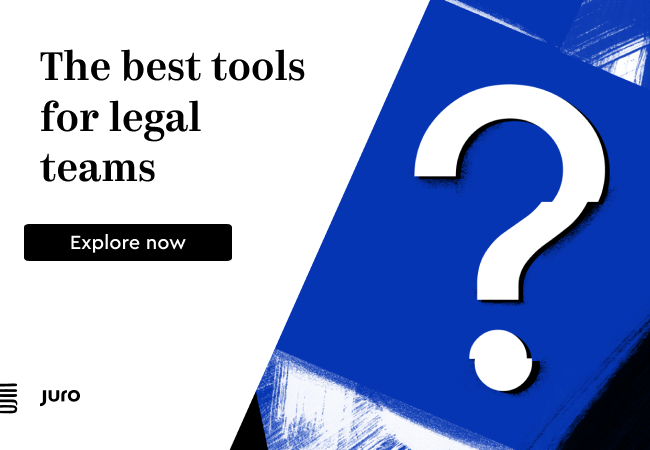 The legal market was already starting to change, especially in the last couple of years, but the growth of EY and its peers will only help to accelerate the change that is already in motion. Watch this space for what happens next.